1000 Copies of "To The Bright Edge of the World" Sold at Fireside Books! 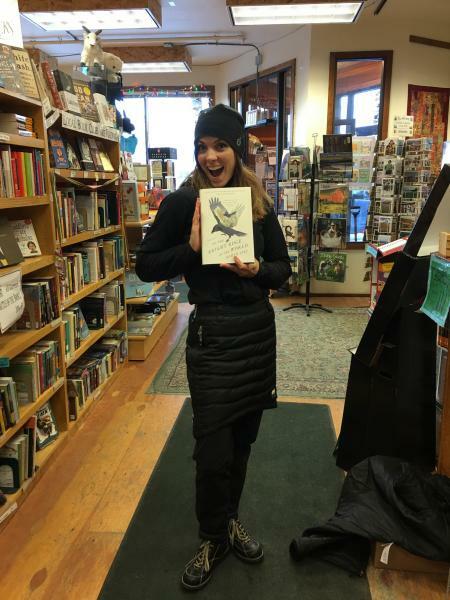 A bookstore in a town of about 6.400 people just sold 1000 copies of Eowyn Ivey's new novel, To the Bright Edge of the World, Heather Campfield (shown here) just bought the 1000th copy of To the Bright Edge of the World sold at Fireside Books! She says she bought several copies of the novel as gifts. Eowyn Ivey's second novel. The novel -- a dual story of exploration -- on the frontiers of photography and in the wilds of Alaska -- has been a mainstay of Palmer conversation since it was released.last August. Eowyn Ivey was shortlisted for the Pulitzer Prize for her first novel, The Snow Child. A reviewer in Library Journal says that Eowyn's second novel "is even better." To the Bright Edge of the World has received critical acclaim from many other world-renowned writers. Tom Franklin, author of Crooked Letter, Crooked Letter says, "All the pleasures of a great novel are here–the well-crafted sentence, the deft pacing, the compelling plot, and characters that we care passionately about." In the winter of 1885, Lieutenant Colonel Allen Forrester sets out with his men on an expedition into the newly acquired territory of Alaska. Their objective: travel up the ferocious Wolverine River, mapping the interior and gathering information on the region's potentially dangerous native tribes. With a young and newly pregnant wife at home, Forrester is anxious to complete the journey with all possible speed and return to her. But once the crew passes beyond the edge of the known world, there's no telling what awaits them.